Please look at the following image which is a popular 2006-2012 Toyota Corolla head unit from Seicane after installation. 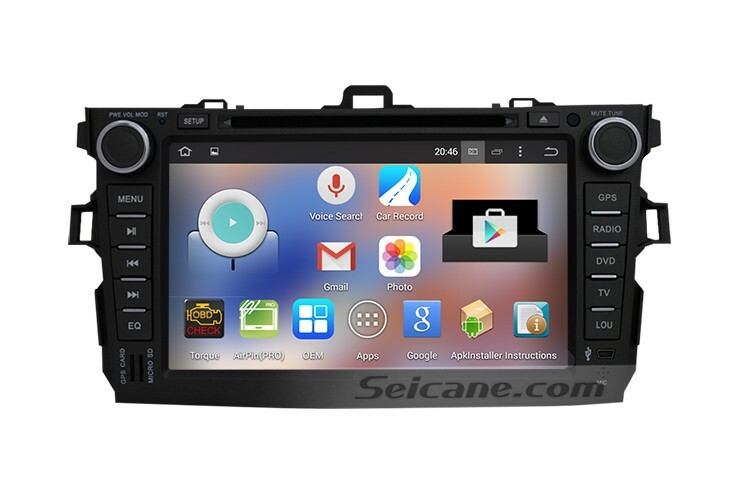 Installing such a new head unit into your car, you are able to enjoy many new functions, such as GPS navigation system, DVD player, Bluetooth hands-free calls, Bluetooth music, FM/AM radio, iPod, TV, USB, SD card connection, etc. A great deal of convenience and enjoyment is available for you when you are driving. Replacing your factory radio with a new head unit can bring you new driving experience. Let’s take this 2006-2012 Toyota Corolla head unit as an example, you can easily pair with your mobile phone via Bluetooth technology to make hands-free calls and stream music to keep safe and pleasant all the way. Its phonebook function also enables you to search for the contact name and number directly on the big screen if you download your phonebook from your mobile phone. Besides, the latest 3D GPS navigation system can provide you with the most accurate direction to lead you to your destination. Since there are so many benefits that you can get from a new head unit, then is it hard to install it and how? In fact, the installation of a new head unit is not difficult. Here I’d like to share the way to install a 2006-2012 Toyota Corolla head unit with you. First of all, you need to remove your original radio in your car. Before the removal, it’s necessary for you to disconnect the negative cable on the vehicle battery to ensure safety. And you need to prepare a lever and a screwdriver before the removal. After that, you can start the removal. Above all, you need to remove the panel with a lever and put it aside. Then you unscrew the screws holding the original radio in the dashboard with a screwdriver. At last, take the original radio out of the dashboard gently. Secondly, connect your new head unit into your car. You need to connect the wires correctly. If you find it a bit difficult, you can do it as the user manual shows. A wiring diagram which you can get from your dealer is also helpful. You can connect the wires according to color scheme in most cases. If you still have questions, it’s suggested you consult your dealer or a professional. At last, install everything into their original places including all screws and the panel. That’s all about the installation of a new head unit. If you want to get help which is more intuitive, you can surf the internet to search if there is related video for the installation of your car’s head unit. You can easily find your way to the desired destination with the help of the turn-by-turn directions and the voice prompts provided by this Toyota Corolla head unit. To pair your compatible mobile phone with this unit, you can make and receive calls without taking your hands from the steering wheel control to ensure the security. Playing DVDs, iPod, TV programs, movies, cartoons, etc., you can keep your passengers from being bored and tired on the long trip. Wish you like this Toyota Corolla head unit and enjoy your brand new driving experience from now on!